IDC IIT Bombay M.Des Admission 2018 will be done on the basis of the CEED Scores for 2018 - 20 session. However, the candidates will also have to further appear for an admission test and interview. The Master in Designing course offered at IIT Bombay is provided by Industrial Design Centre (IDC) which is also known as the design school of India. IIT Bombay is famous institute which offers undergraduate as well as Postgraduate programs in various streams. The shortlisted applicants will be called at the IDC Kolkata for the further selection process. The last date to apply for the IDC IIT Bombay M. Des Admission 2018 is 20 March 2018. There is no age limit for admission in IIT Bombay IDC M.Des program. However, applicants must be a graduate and must have completed their Class 10 and 12 followed by their graduation. The candidate should have a minimum of 55% marks or equivalent grades in the qualifying examination to apply for M. Design program. Qualifying Exam: Candidates will get admission in M. Design on the basis of CEED scores. Therefore, the candidate must be qualified through Common Entrance Examination for Design (CEED) to get admission in IT Bombay IDC M.Des Program. Candidates are free to apply to any number of streams. The candidates need to submit separate application forms for each stream along with the applicable fee. Bachelor’s degree in Design/Engineering/Architecture/ Interior Design: 10+2+4 years (minimum four years Bachelor’s course). Professional Diploma in Design: 10+2+4 years (minimum four-year diploma program). GD Art (4-year program after 1 year foundation minimum entry requirement 10th pass). All the candidates who have qualified CEED and carry a valid score can apply for admission to M.Design program for various streams mentioned above in Industrial Design Centre (IDC), IIT Bombay. Candidates are advised to check the eligibility criteria before applying for the program. The link to apply for the IDC M.Des Application Form is given below. The last date to fill the IDC, IIT Bombay is 20 March 2018. STEP 2 (Filling up the Form): After the registration, the candidates will be required to fill the form by providing the Personal Details, Educational qualifications etc. STEP 3 (Payment of the Application Fee): After filling the form, the candidates would be needed to make the payment in order to complete the application form. STEP 4 (Confirmation Page): At the end, the candidates who have filled the form can download the confirmation page after the submission of the application form. 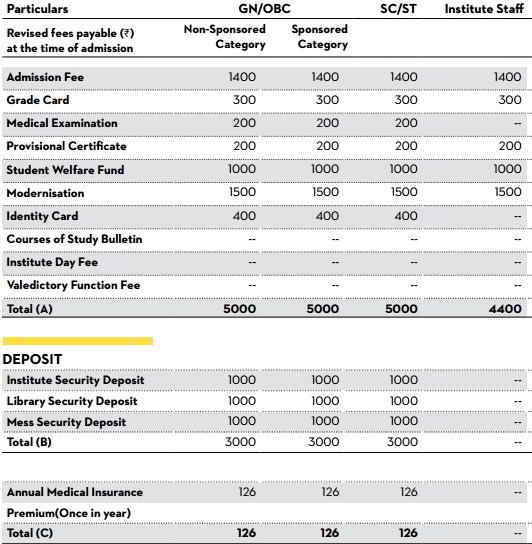 IIT Bombay IDC M.Design Application Fee for each category is given in the table below. Candidates are advised to select the right category while filling the form. The application fee for each category is different. Therefore the candidates are advised to make the payment of the fees according to their category. The candidates can find the details of category wise fee classification which is providing details of Fees, Deposits and Hostel rent is given below. The IIT Bombay M.Des admission will be done on the basis of CEED. The CEED exam was conducted on 20 January 2018 and the result for the same will be declared on 5 March 2018. CEED Merit list will be prepared on the basis of the scores of the candidate. The complete details about the CEED Result can be obtained by following the link below. STEP 2: The merit list of the candidates will be prepared on the basis of their application form and the category wise merit list of the candidates will be prepared, who will be called for the further admission process. 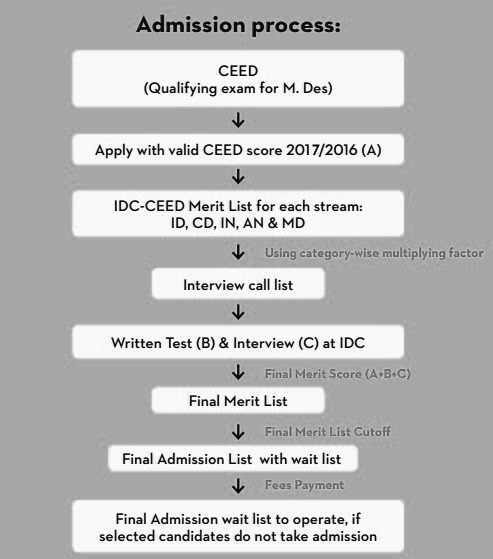 STEP 3: Students selected in the merit list on basis of CEED Exam (also known as IDC CEED Merit List) would be selected for the Interview and the Written test and Interview. STEP 4: The category wise and the course wise merit list of students will be prepared and those students whose name appears in the merit list(also known as Interview Call list) would be called for the interview and written test. STEP 5: Interview Call list is decided on the basis of category-wise seats available in each stream and by using a multiplying factor for each category. STEP 6: Afer the written test and interview, a category wise Final merit list using final scores will be prepared. The final score would be the total of CEED marks, written test and Interview marks weight age as per given in the table. STEP 7: Candidates with the final score that is less than the Final merit list cut off for their respective category will not be considered for admission even if a seat is available in that category. The candidates will be selected on the basis of CEED scores. The CEED exam pattern is given below. The Examination will consist of two parts, PART A and PART B. Both the parts will be conducted on the same day. The Exam will be conducted in the English Language. Candidates who qualify Part A will be eligible to appear in the CEED part B exam. CEED Merit List will be based only the score of Part B exam. CEED Exam Part A is only a qualifying exam. This part of the examination will be given on answer book. i.e. it is an offline exam. Part B has 7 questions and Question 1, Question 2 and 3 are mandatory and Question 4, 5, 6 and 7 are Optional and the candidates have to answer only 1 of the question. The seats offered in M.Design for each category is given in the table below. A total of 2 seats, which is 3% of total available seats are reserved for PwD candidates.The total 30 seats are reserved for OBC(NC), SC and ST category in which the seats are divided as 16, 9 and 5 respectively. Phone: 022 - 2576 7801, 2576 7802.